John Berger was one of the most influential thinkers and writers of postwar Europe. As a novelist, he won the Booker prize in 1972, donating half his prize money to the Black Panthers. As a TV presenter, he changed the way we looked at art with Ways of Seeing. As a storyteller and political activist, he defended the rights and dignity of workers, migrants, and the oppressed around the world. "Far from dragging politics into art," he wrote in 1953, "art has dragged me into politics." He remained a revolutionary up to his death in January 2017. Built around a series of watersheds, at once personal and historical, A Writer of Our Time traces Berger's development from his roots as a postwar art student and polemicist in the Cold War battles of 1950s London, through the heady days of the 1960s--when the revolutions were not only political but sexual and artistic--to Berger's reinvention as a rural storyteller and the long hangover that followed the rise and fall of the New Left. Drawing on first-hand, unpublished interviews and archival sources only recently made available, Joshua Sperling digs beneath the moments of controversy to reveal a figure of remarkable complexity and resilience. The portrait that emerges is of a cultural innovator as celebrated as he was often misunderstood, and a writer increasingly driven as much by what he loved as by what he opposed. 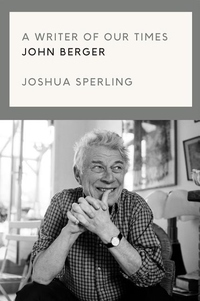 A Writer of Our Time brings the many faces of John Berger together, repatriating one of our great minds to the intellectual dramas of his and our time.